I don't want messages about who found what in which game. I'm not interested in seeing "They found someone who gave them x" or "They have reached level 67! Help them fight the terrible raging moths of doom and rule the world!!" at the top of the page every time I open Gwibber. There are really two bugs here: first, even though I hide an application via the facebook website Gwibber still shows messages from that application. Second, Gwibber itself doesn't have a hide button. probably for your issue number #1 this functionality was published under bug 539220 and for the hide function if you are agree with me I can mark this report such a wishline one for that feature? Thanks! Yes, I think so... with the exception that I don't want to block a user - just hide posts from particular applications or games. Marking this as a paper cut because I believe it really tarnishes the use of Facebook on Gwibber. This is a feature request, not a paper cut. oops I mean wishline/wishlist one, heheh. I have changed this to confirmed as it is a definite problem. 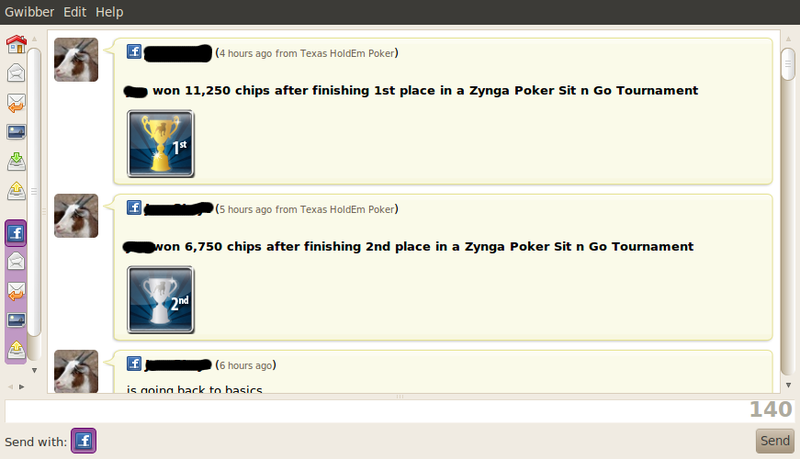 If your contact plays games (one of mine is into Teaxs HoldEm Poker) you get messages about it. On the Facebook web site you can hide them, but Gwibber still shows them. This is particularly annoying as these messages are larger (deeper) than ordinary messages as they contain ig icons. See my screen shot. This is not quite the same as the Bug 539220 problem as it is about hiding certain types of messages, not particular senders. Please can this be marked as a Wishlist item. This really makes Gwibber unusable with Facebook for me, which is sad because i would really like to be able to use it. +1. Constant segfaults would be less annoying than pointless game updates from facebook. I hope this gets raised to critical. +1 from me, too. I've disabled my Facebook account in Gwibber because of this problem, though I would very much like to enable it. There is no work around for this, apart from unfriending game players. I notice the messages I want to hide are all trivially identifiable ('nnn minutes ago from Happy Aquarium' or 'nnn hours ago from Treasure Isle'). This would seem a good field to filter on.